The debate over who was here first started about the same time that Columbus was first arriving in the New World. In 1590, a Spanish Monk named Friar Joseph de Acosta reasoned, after much examination and comparison, that most of what was in the New World simply walked over from the Old World. He postulated a land connection between northeast Asia and northwest North America, even though that area was completely uncharted in his day. In the post-Revolutionary War United States, the scientific community was discouraged from looking into the issue so that they wouldn't inadvertently give any kind of legitimacy to the Native Americans or to their claims to the land the Europeans were stealing. By the early 1900's, the archeological community had been looking and was generally in agreement that Native Americans had been in the country no more than 4,000 years. Then, in 1908, George McJunkin, the son of former slave parents, found the first Folsom Point. At the time, he was working as foreman on the Crowfoot Ranch near Folsom in northeastern New Mexico. He was also an amateur fossil collector, arrowhead hunter and naturalist. One day after a flash flood he came across some strange looking bones sticking out of the side of Wild Horse Arroyo. They were a local curiosity item until Carl Schwachheim came over from Raton and took a look at "McJunkin's site." He got in touch with Jesse Figgins, director of the Colorado Museum of Natural History. Figgins visited the site in 1926 and organized a full excavation for 1927. That's when the actual Folsom Point was found. Radiocarbon dating places these artifacts at 10-to-11,000 years old. 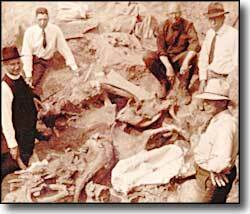 Folsom Man lasted as the first Native American only until 1932 when Frank Garner spotted several large animal bones along the South Platte after a spring flood near Dent, Colorado. The bones turned out to be from mammoths and Jesse Figgins was called in again. Among the bones they found a distinctive long fluted projectile point with 2 similar points nearby. This was the first evidence of association between early man and mammoth in the New World. The mammoth bones were radiocarbon dated at 11,200 years old. Figgins assumed the fluted points to be a variation of the Folsom style. In 1934 another significant find was made at the Lindenmeier site, near Fort Collins, Colorado. Where Folsom had been a single kill site, Lindenmeier was a well-used camp. Archeologists have found a variety of artifacts giving them a view into early lifestyles. The technologies of point making are displayed in a mass of finished, ruined and partially constructed points. The various bones found indicate a diet of turtle, wolf, coyote, fox, rabbit, pronghorn, and bison. Bone needles, knives, scrapers, and engraved bones (game pieces) were also found. Downstream at the Jurgens site they found stone seed grinders and a nicotine-coated pipe. At Jurgens, the early Americans ate elk, reptiles, beaver, deer, moose, fish, muskrat, and certain members of the dog family. By 1937, excavations at a huge site at Blackwater Draw near Clovis, New Mexico, uncovered a whole new pre-Folsom "cultural complex" that was soon termed "Clovis." The spear points that Figgins found at Dent actually belong to the older Clovis culture. Radiocarbon analysis points to a date between 11,000 and 11,600 years ago. At that time, Blackwater Draw was an extensive series of seasonal ponds, natural gathering places for large anmals such as bison and mammoths. 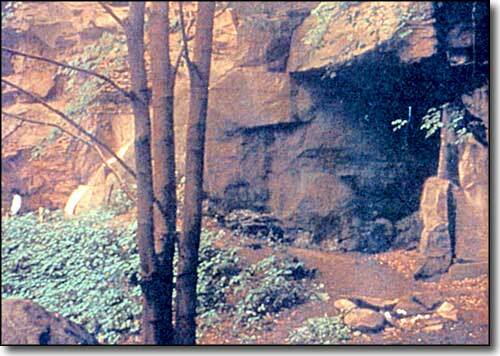 This was an ideal hunting place for the Clovis people. 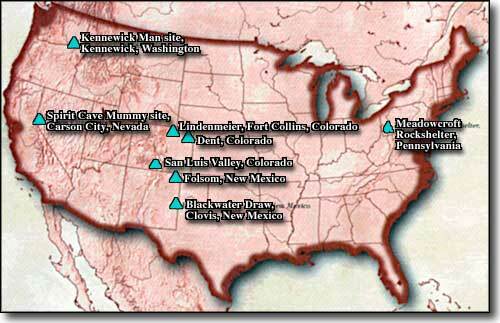 In the following years, Clovis-type sites were found all over the United States, southern Canada and Central America. The strange thing is the Clovis people just suddenly appeared, there is no evidence of a culture ancestral to them in the New World. The Clovis people were very efficient hunters, taking down 13-foot-high mammoths and giant bison, and are responsible for the first American technological revolution: the Clovis point. The point is bifacial, meaning chipped on both sides. The points are also fluted with a single flake removed from the base of the point so that it could be securely fastened to a wooden spear shaft. The Clovis people also used a spear throwing stick called the "atlatl." The bow and arrow didn't show up until 1,200 years ago. The earliest Paleo-Indians probably came here from the Lena Basin of Siberia, between 15,000 and 20,000 years ago. The second wave, the Athabaskans have genetic connections with populations from the northeastern forests of Siberia. The Athabaskan tribes include the Navajo, the Apache and several northwest coast groups. 4,500 years ago the third wave: the Aleut-Eskimos arrived from the Amur Basin on the Chinese-Russian border. So then, were the Clovis people the first Americans? 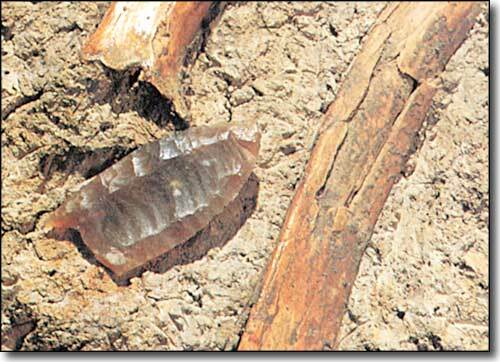 At the Meadowcroft Rockshelter in Pennsylvania, archeologists have found materials dating to between 13,900 and 14,500 years ago. Another site at Monte Verde in Chile has been dated at 12,500 years old with a nearby fire site dated at 33,000 years old. Other debated sites in the Yukon and Alberta have recently been dated between 17,000 and 20,000 years old. Finds in Calico, California (200,000 years old) and Hueyatlaco, Mexico (250,000 years old) are even more controversial. So the speculation these days is about Native Americans coming from both Europe and Asia at about the same time. The only offical comment is the date to beat: older than 12,500 years.